* Hedge cutting tips & tricks. Garden hedge trimmers have advanced in design and with them the job of hedge cutting is much easier. You can take advantage by selecting the most suitable machine for your type of hedge plant, its growing height, and how you wish to maintain it. So what type of hedges are you growing? Below you'll find how different powered machines and hand shears are suited to a particular style of hedge. Neat, fine textured, regularly clipped hedges. First let me introduce the Garden Groom Safety Hedge trimmer. The cutting bay has a grill protector to prevent cutting electric cables and there are 2-hands-on safety switches. The machine comes with a clip on collection box. But it also connects by a tube to a volume collection bag that is placed on the ground. These hedge trimmers work best when regularly used to keep fine leaved hedges neat and tidy. They give you no excuse for putting the job off as you don't need a garden vacuum or rake to clear up afterwards. The Garden Groom is limited to cut small portions at a time and works best on soft lighter growth. Of course that's ideal for neat regularly trimmed hedges, like Yew, Leylandii, Privet, Box... But even if the hedge gets longer you can reduce the length in small steps. With fine hedges the Garden Groom encourages you to care for them properly simply because you use it. You are looking for very short hedge trimmers or shears. And you can get both in one cordless machine. The trimmers sweep quickly across level surfaces and edges. They are short enough to shape curves too. The shears cut forward into small spaces. They are both ideal for maintaining curved shapes in fine hedges. The calm and steady clip clip was once a common sound around the village green. And if you maintain your hedges regularly there is still enormous satisfaction to be gained in using manual hedge trimmers on summer days. Sharp and hard blades - this is very important, but take care. Most of these features are available in the Wolf Garden range. You don't have to be growing Becher's Brook or The Chair (of Aintree Race Course fame) in your garden to be faced with a tough job. But thanks to power driven hedge trimmers a single gardener can often tackle some extraordinary hedges. Leylandii, Chamaecyparis, Yew, Thuja... which have been allowed to grow. How do you tackle the top of a hedge when you can't reach it? That's a good reason to keep your hedge to a manageable height especially in smaller gardens. But the tall hedge problem has now been solved by hedge trimmers mounted on telescopic poles sometimes known as pole trimmers / pruners. 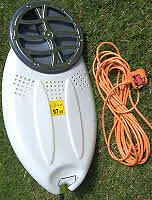 Tony's telescopic hedge trimmer has a petrol power pack at the bottom for good balance. A swivel joint allows you to set the angle of the cut. You end up walking alongside the hedge holding the hedge trimmer above you to cut the top that is out of reach and even out of sight. However, this is not always simple. You have to cut the top level without seeing it. And hedge cuttings may remain on top. So do get into the habit of cutting regularly to reduce these problems. Fortunately you can make the job is easier with long-handle hedge trimmers - see below. Moreover you can now get pole trimmers with chainsaw attachments. Chainsaws or rotary blades are useful for thicker material. They don't bite and chew thick stems like reciprocating blade hedge trimmers can do. Pole trimmers with the motor at the bottom end are better balanced. Even if they are electric the cord is safely out of the way. You may find suitable pole trimmers for your garden on these links. How can you cut across the top of a wide hedge? You'll find longer bladed hedge trimmers are a 'must have' for dealing with wider hedges. And on large hedges you'll get a more even finish with fewer sweeps and less strain. Cutting a tall hedge with the help of a ladder or platform adds to the dangers. A gas /petrol powered trimmer may be heavier, but an electric power cord near to the blades adds both a significant hazard and a nuisance. A residual current detector (RCD) or circuit breaker is essential. Always cut the sides first so you get near enough to reach across the top. You can also cut the hedge in an A shape so that it is narrower at the top. Before completing, use a long-handled wire rake or brush to comb the hedge free of hedge trimmings. This also reveals straggly left over bits that need neatening. You'll need tough gloves and overalls to help you deal with the thorn hedges. And protective glasses are also advised. Berberis darwinii and Holly have prickly leaves, but many such as Berberis atropurpurea, have viciously sharp thorns. For ornamental hedges that flower on old wood usually in spring, cutting should be done after flowering. For hedges that flower on the current year's wood cutting should be done before the Fall. Fine strong growing hedges like privet benefit from an early summer cut before the late summer cut. When old hedges like Beech are cut in late summer they can release lots of organic dust. It's best to wear a face mask. With regular attention you can keep these hedges neat and maintain them reasonably well with powered hedge trimmers. But if allowed to grow they will open out. Rather than cutting straight across the top, hard prune weaker shoots to encourage re-growth and shorten long leaders by two-thirds. Sometimes you may have to use traditional hand shears or long handled secateurs. Read safety advice below. Find Power Driven Hedge Cutters, Manual Shears, Gloves etc... on this link. Hand secateurs, and manual hedge shears are essential. These relatively open growth habits need to be carefully pruned. Large leaved hedges look unsightly if cut by blunt hedge trimmers or if the leaves are simply sliced through. They should be more carefully pruned. Shorten about half the branches every year in a thinning operation. This leaves a nice display of uncut ornamental leaves. And with the likes of Skimmia that take a year from flowering to berrying it always leaves new stems to flower and berry every year. Always plug cables to a residual current detector and circuit breaker, either as a separate plug or built into your domestic electricity distribution board. Garden Groom safety hedge trimmer, shreds and collects hedge trimmings as it cuts. Check this page for the Poulan Pro Powered Pole Pruner with String Trimmer Attachment - 2 power tools in one. For Powered Hedge Cutting there's a well organised choice on this link at competitive prices. Look out for the Multi-Tool Systems:- pole trimmers, mini chain saws, brush cutters & strimmers... the cable poses little problem on these easy-to-handle tools. And if you want to buy something big don't forget to use Voucher Code MowDirect20 to get £20 off £300 on this link. Garden Groom shreds and collects hedge trimmings as it cuts. The Garden Groom is also available on this link to specialised garden tools. There's information here on your selected garden power tool for lawns, hedges, organic waste and earth with tips on using them effectively. Do you run a gardening website - with information to interest my visitors? To set up exchange links from/to suitable pages - click here.